today we’re gonna take a look at what fashionable English women would have worn in the spring of 1832. In addition to the usual prints featuring walking and ball dresses, we also have some interesting images of a wedding dress, a court dress and a simple dress women would have worn in the privacy of their own homes. I think they are all very pretty. And you? A dress of olive green satin. The corsage is of velvet, and shaped en corset. This body is of an entirely new description, and has only been executed by the first dressmakers in Paris. A particular degree of skill is necessary in the disposition of the whalebones, so as to give it a graceful shape and style of fit. A few folds en Sevigne, are sometimes placed across the bust, and a standing ruff of blonde, a la Midicis, complete this novel and elegant dress. Long sleeves of blonde. Turban of white cachemire ornaments, with ostrich feathers. Of rose-coloured watered gros de Naples. The corsage is plain, and very open in front, to display the blonde chemisette. 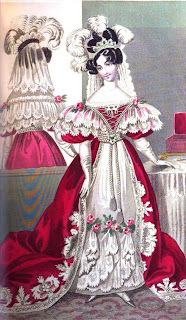 In front the pelerine ends in two points en fichu, but it is closed behind, like the corsage, and trimmed round the top with a row of single bows and ends of gauze ribbon. Long ceinture tied on one side; the ends are brought across the front obliquely, and terminated with two bows of ribbon. Coiffure a la Flore; consisting of a spiral wreath of roses, tastefully dis posed among the bows and curls. A robe of white satin trimmed with blonde, flounces set diagonally; each finished with a bunch of moss roses. The body is profusely ornamented with blonde and pearls. On each shoulder is placed a rose similar to those which decorate the skirt. Train of ponceau satin richly embroidered with embossed silver; it is fastened on round the waist with a band of pearls, from which depends a cordeliere finished by two tassels of pearls. Head dress: diamonds and emeralds, with a lume of ostrich feathers, and mantilla of blonde. White satin gloves; shoes of silver tissue. 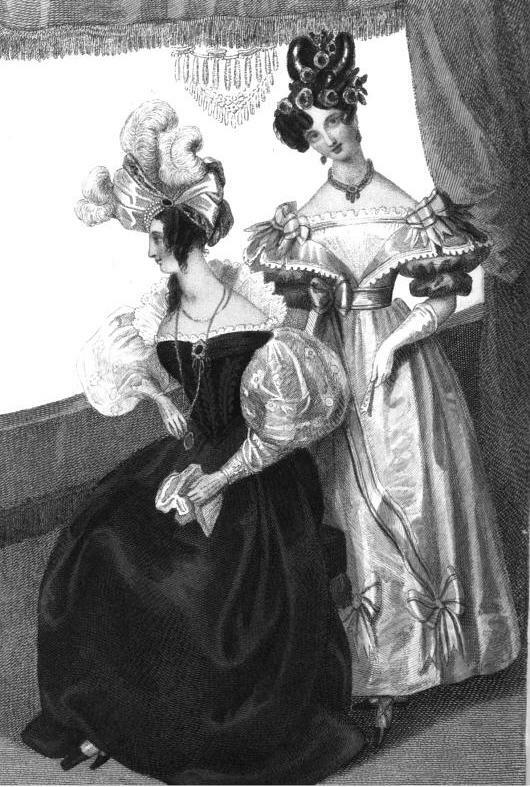 A high dress of jaconot muslin, the ainage is very full, and finished round the throat by a narrow round collar, edged with a quilled net. A rich embroidery surmounts the hem at the bottom of the skirt. Over this dress is thrown a loose robe, a l’orientale, composed of a tissue of light wool, striped and figured with silk; the lining is of blue taffeta. Cap of embroidered net, trimmed with blue gauze ribbon, pantoufles of black velvet. Pelisse of sea-green gros des Indes. – The corsage is set in deep plaits; which are confined on the shoulder by three bands, each finished by two beautifully wrought silken buttons. The collar is square, and vandyked; the epaulettes, similarly vandyked, have a division in the middle, which is partially reunited by two buttons. A row of buttons closes the skirt in front, and a deep vandyke forms the revers; trimming round the bottom. Hat of lavender satin, with bows of pink gauze ribbon, two satin languettes edged with blonde, issue from the top of the crown; their points unite near the brim on one side, where two bunches of pink acacia are fastened, the one pendant over the brim, the other placed nearly upright on the opposite side. 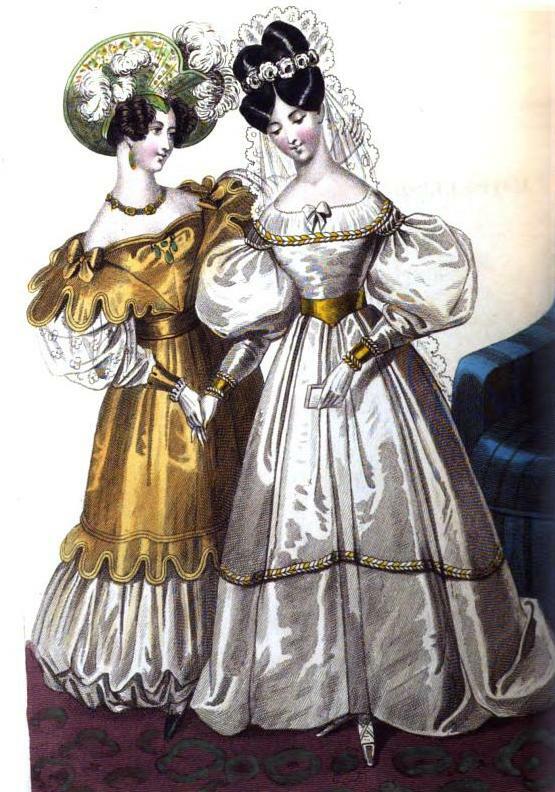 This costume is remarkable for its richness, and exceeding simplicity; it is composed of a white satin dress; the corsage uni, cut very low on the bust, finished with a double cordon of gold and satin rouleaux twisted alternately. The bosom is shaded bv a tucker of tulle, a la vierge. The skirt is very ample, and set round the waist in deep double folds; it is cut of an ordinary length in front but gradually increasing on the sides, so as to form a sort of train behind. Its only trimming is a cordon, similar to that round the bust, and sleeves. Zone of mosaic gold and plain gold bracelets. The coiffure is of a corresponding simplicity, merely dressed in full bows and braids; with a wreath of white roses, and mantilla of blonde. A dress of straw-coloured Levantine; or, watered gros de Naples. The body is plain, and is slightly gathered into folds on the bosom, by Sevigne brooch. 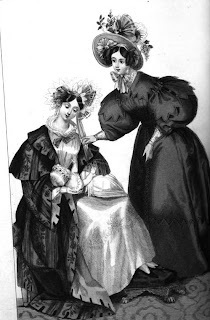 The cap is scalloped, and edged with two rouleaux; it is pointed en fichu in front, increases in width on the shoulders, and is continued straight across the back, with but a slight diminution in its width. A row of scallops and rouleaux surmount the flounce, which is of tulle, and gathered in at the bottom, in bouillon. Beret of white crape printed in a fanciful pattern of gold and flowers. A small bunch of marabouts is placed over the curls on the right side, and a larger bunch falls on the other side over the brim, which is shaped en coeur, and edged with a rouleau of green satin. Necklace of emeralds and pearls.